“Never forget” is echoed in remembrance, and no…we never will. My newsfeed on Facebook is filled with love and adoration for America today. In a strange, but good way – I appreciate days like this where something so beautiful is honored, in multitude, out of an event that was so, so terrible. September 11th, 2001 – I remember getting the news over the loud speaker. I was sitting in Mr. Grace’s early morning class. 1st period of the day I think. Of all the classes and disciplines to be learning when I got the news, it was oddly enough: Humanities. It was my senior year at Conestoga High School, in Berwyn, Pennsylvania. Our Principal’s voice came on the loud speaker, which was only common for big, school-wide announcements. Her news echoed with both sadness and genuine care in her voice. Mr. Grace immediately turned on the classroom’s T.V. and we watched in shock and confusion as this terrible, unforgettable event unfolded. Tears fill my eyes as I think back to the images I saw on T.V. ; when those towers were hit, when the Pentagon was hit, when the towers fell, when debris and a storm of grey dust overtook the streets of our beloved NYC like something out of a Hollywood action movie. “Is this real?! How is this happening?! Why would anyone commit such an inconceivably malicious act.” I thought to myself. How does a generation that didn’t necessarily know or remember “war” comprehend such an attack? It was confusing, heartbreaking, upsetting, and terrifying all at once. It still is. The memory of this day will always surface a heavy heart for so many of us. What I do know, moving forward, is that America is untouchable. I don’t mean our buildings, our streets, our farmlands, or even us as people – I mean America. The dream and spirit of America is a force that will forever remain unbreakable. It represents what I love about humanity. It’s the most beautiful mixture of cultures and creeds, celebrations and causes. It’s the empowering initiative to start your own business, for me to write my own opinion on this little ‘ol blog of mine, for me to call it whatever I want, for me and Sean to embark on a new part of the country. Though we will never forget what happened on this day, years ago, the strength and mission of our great country is stronger than any force that attempts to break the freedom and equality that we so heartedly work to maintain. God bless the men and women who serve, and have served our country. I also want to add one more thing related to this date, because it’s really important to me and my family. September 11th, 90 years ago, was the day that my dear Grandmama, Carolyn McGoogan, was born. She’s my wonderful Mama’s Mama. Y’all, she is an INCREDIBLE woman. Today, she celebrates her day where she lives near Charleston, South Carolina. I miss her dearly. I miss her giggle, her sweet-as-pie Southern accent, her inner strength, her unwavering love of the Lord, her precious eagerness to jump into prayer – always reminding me how easy that is to do. And also…this lady makes sourdough rolls, veggie stew, and chocolate pie like you wouldn’t believe. 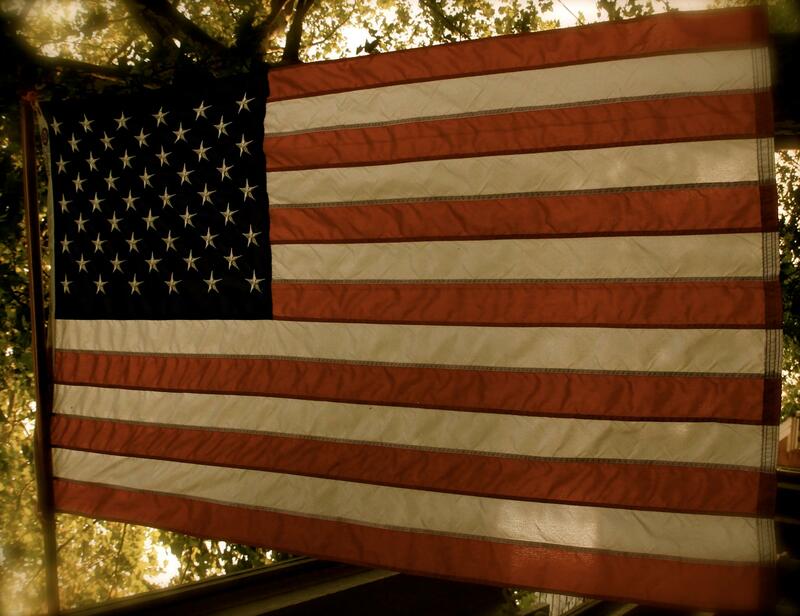 So on this day…we honor America. …and I selfishly ask that today you also smile for/pray for/think of my beautiful 90 year old Grandmama Carolyn today :). I was in that class with you and I have replayed that morning over and over in my head all day & every September 11th since 2001. I will never forget the fear and worry I felt as I knew my mom (who worked for FEMA) and my dad (Army) would both be involved in the recovery efforts and after effects in some way. My mom spent two weeks at ground zero starting the night of September 11th, 2001 and my dad’s unit supported a unit in NY for a month. It brings so much pride that our country comes together, through that “unbreakable” spirit, to help and support each other in times of trial and heartache. Thank you for your words! What an emotional day to remember, especially for your family, Sarah! I never realized how oddly timed it was for us to hear the news of this in a class on Humanities. So glad we had classes like that together and could support each other for years to follow. Thanks for your words too!